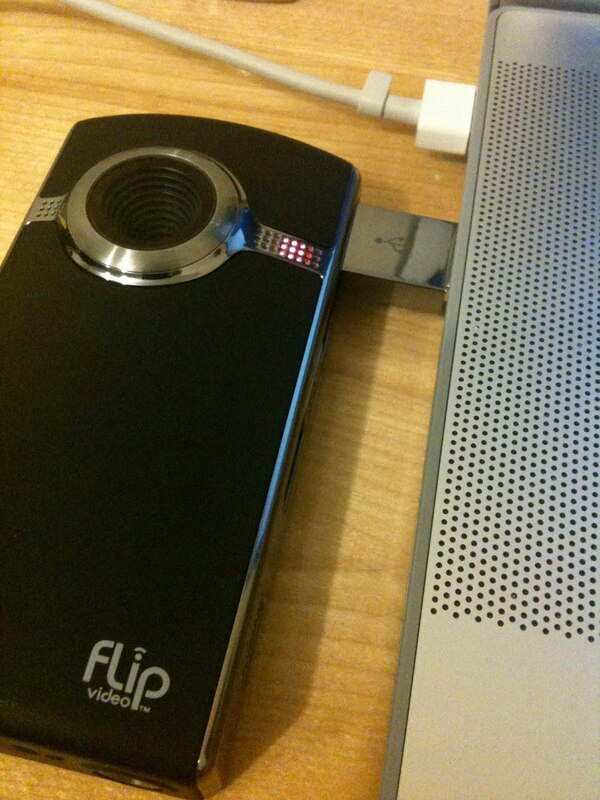 The Flip Video UltraHD camera. Cue Journey's "Open Arms." The next time I see media-production majors carrying giant cameras, tripods, craft services tables, human torsos, bazookas, and whatever else is in their monster-sized duffel bags, I will record it for posterity on my new Flip video UltraHD camera. The Flip is a low-cost ($220), handheld HD camcorder that lets you shoot and save glorious HD video and instantly watch it on your HD TV (there's an HDMI output jack), YouTube (it uploads to the site automatically), or the device itself (eight gigs!). The Flip comes by its name honestly; it's got a USB connector that literally flips out of the side of the camera, and which you can connect into a USB port in your laptop. An inappropriate display of public affection? 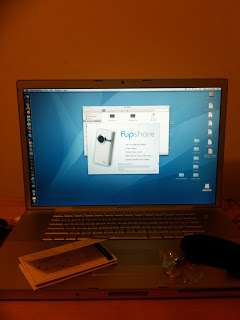 When you plug in the camera, your computer automatically launches FlipShare software. You don't have to install the software or download it: it's right onboard the camera and ready to do your bidding. Nifty. The software lets you upload your video directly to YouTube and MySpace, save it to your computer, email it as a greeting card, burn DVDs, take snapshots out of the footage, or edit together a movie by dragging and dropping your clips, slapping music into the background and adjusting the volume. 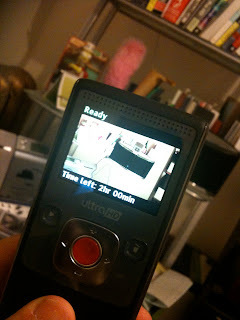 The camera controls are pretty simple and intuitive - perfect for a sensitive, dumb guy like me: you push the big, red button to record and stop recording, the plus button to zoom in, the minus button to zoom out, the play button to play, and the garbage-can button to delete. The two buttons on the side of the big, red button help you skip between videos when you're playing them back. Homer is ready for his closeup. When you're shooting, the two-inch LCD screen gives a pretty great indication of what you're looking at, and it seems to work well in sunshine and shade. It does, however, really look like a camera, which means my days of shooting boneheads talking loudly on their cell phones on the bus may soon be over. Or maybe just my days of shooting boneheads talking loudly on their cell phones on the bus without getting a punch in the nose may soon be over. The camera can hold up to two hours of HD video, and the onscreen display tells you how much time you have left. What you don't have anywhere, however, is a battery life indicator. So, when your camera is plugged in, it's charging. When is it full? Who knows! The manual says, "about six hours," but also says that constantly charging it could hurt its life. Boo. The camera comes with rechargeable batteries, but it apparently also takes regular AA batteries. I shot the video, below, earlier today, and you can see how colorful and sharp the picture looks, though moving objects - objects that move faster than the camera's "720p video at 30 frames a second?" - look a little jittery. The sound quality is really good - the camera picks up pretty much everything that's going on around you, including behind the camera, and it does a good job of highlighting the voices closest to the camera over background noise. In-camera playback is equally great. When you press the play button, the camera plays the last clip you shot: the sound and video are crystal clear, you can pause it wherever you like, or skip to the previous videos using the navigation buttons. I'll be giving this thing the true test next week in Chicago, but having used it for but one day, I can honestly say this: it beats the hell out of carrying around a duffel bag full of bazookas for a living. I've read only good things about that camera. Most of the big vloggers on YouTube are using that camera because it's super sharp quality, is very easy to take around, and it's such a good price. Will you be vlogging now? Cool! I think I would actually buy this. Is it weird that while watching your test video I was reminded of TMZ. I wonder if they're handing out these babies for their nosey crew? It's a pretty great camera - every media production major should have one! It is very TMZ. Now if only there were some celebrities around. When can cre-commers Kenton Larsen to join the internet's 1 Billion dollar underground "film industry"? I have a similar camera and it also takes stills. It's fantastic to take on vacations I have a great video of Amanda and I in Santorini last summer, watching the sunset over the caldera and we hear a live version of Phantom of the Opera being played in one fo the cliff-side bars. Hey! I think I'll watch it again tonight! That's great! Today I shot a woodpecker going to work on a telephone poll with Leonard Cohen playing in the background. No joke! Ha, ha! Make that "pole." Whatta day. I'll blame the marking.